The Homians had a simple dream: escape their poisoned world by colonizing a comparatively pristine planet. Earth is an almost perfect candidate. While it is inhabited, the natives are backward and will be easy to displace. All that is required is for the world to be seeded with Homian organisms. The recorded minds of a select few Homians will then be downloaded into compatible hosts so they can prepare the Earth for its proper owners. The plan is straightforward. Implementing it doesn’t go as planned. A Homian seed took root in Rosewater, Nigeria. An enigmatic structure grew. It’s the foothold for the invasion. In the long run it’s the harbinger of human doom. In the short run, it’s a resource, one that crafty humans have learned to exploit. A human community has grown around the alien structure. Rosewater has become a valuable resource; it has also become a threat to the Nigerian President. Rosewater mayor Jack Jacques demands greater autonomy. The President attempts assassination. When that fails, the President orders a mayoral election. One that will be contested by a second candidate. Jacques resists this challenge to his position. Unpleasantness ensues, and the other candidate dies. Backed into a corner, Jacques issues a unilateral declaration of independence. A previous attempt at secession from Nigeria did not go well1. But Jacques has an ally: the alien at the heart of Rosewater, which is know to defend its territory vigorously. Nigerian forces attacking Rosewater will be blasted from the face of the Earth. Or they would if something were not seriously wrong with the alien. Something has gone awry. Elements of the Home-forming biotech package have turned on each other. The entity at the heart of the city is dying and if it dies, so too will independent Rosewater. The aliens have a backup plan. But something has gone wrong with that as well. Alyssa Sutcliffe has the form of a human and the mind of a Homian. She should step in to take control. She has instead vanished, as far as the Homians can tell. Aminat and Kaaro know exactly where the missing alien can be found: in the middle of an escalating civil war. In the aliens’ defense, they have absolutely no malice towards the humans they plan to exterminate. It’s hardly the aliens’ fault if humans insist on living on one of the few life-bearing worlds available, especially if the humans are so undeveloped, chaotic and focused on the short term as to be easy targets. Really, it would be wrong of the Homians not to appropriate our world. Some readers may object to a story about colonial strife in an African setting. However, Africa is doing better than North America. North America is, as established early in the book, “lost.” Ah, well. Readers may wonder why a declared idealist like Jacques and his allies are willing to ally with alien invaders whose long-term plan is to take Earth for their own. Well, that’s a long-term problem and to get to the long term, one has to survive the short term. Allying with the aliens (or at least orchestrating events so the aliens are compelled to act in self-defence in ways that also protect Rosewater) may be a reasonable choice if the alternative is being bombed to smithereens by the Nigerian air force. Not everyone agrees with Jacques’ glowing assessment of himself or his methods. Just as well that Alyssa, Aminat, and Kaaro get more page time than the would-be great reformer. There are other sympathetic characters in this book, but few of them are politicians or administrators. The powerful do not tolerate dissent. Disagreements can easily turn lethal, which means bad outcomes for the losers in the turf wars and worse outcomes for the little people caught in the crossfire. The Earth’s long-term prospects may seem dim but … perhaps the horse will learn to sing. And there are sympathetic characters who may do well in the short term. 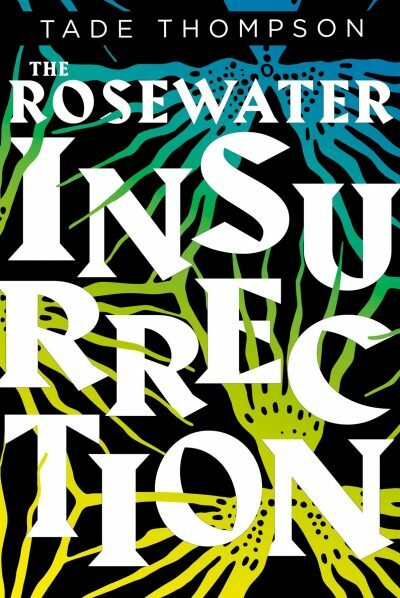 The Rosewater Insurrection is available here (Amazon) and here (Chapters-Indigo). 1: In one of those odd coincidences, I ushered a play set during the Biafra conflict the day before reading this.